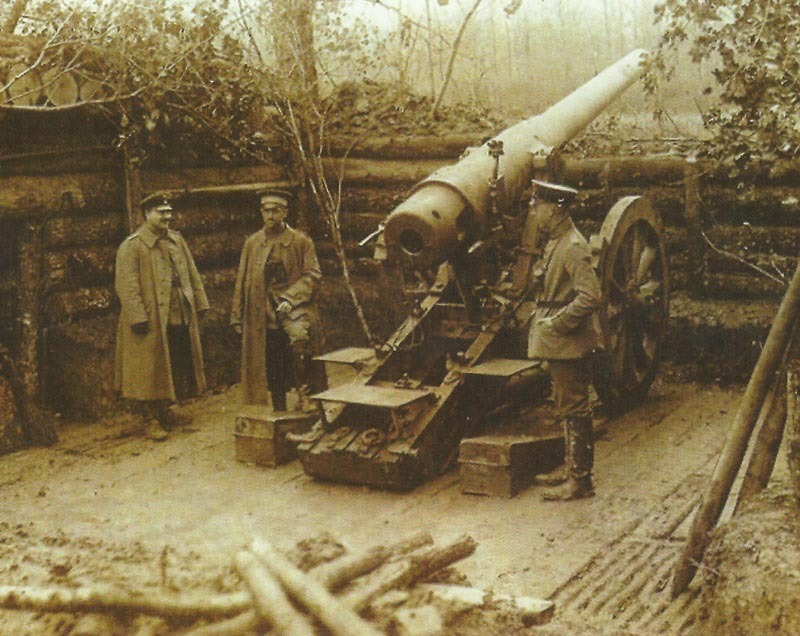 For trench warfare on the Western Front in 1915 reactivated: the old German Long 15 cm gun in prepared firing position. Flanders: Intelligence officers of XV Corps, French Tenth Army, learn from PoWs that extensive German preparations near Zillebeke east of Ypres to employ ‘asphyxiating gases’ (ie chlorine cylinders). Cham­pagne: Reims Cathedral under bombardment. Vosges: German counter-attack ion Fecht valley reaches Herren­berg. Serbia: Austrian river steamer Belgrad tries to break Allied Danube blockade (night 30/31), hits Russian mine and is sunk by Serb 75mm field guns. Austrian GHO morale ‘below zero. The Chief (Conrad) never stops grumbling’. Southwest Africa: McKenzie’s South African Central Force (11,000 men) occupies Aus 80 miles inland from Lüderitz. Britain: King offers total alcohol abstinence in Royal Household for duration of war.